You'll never feel so much LA pride as you do when participating in CicLAvia. A fantastic event that runs 2-3 times a year (and they're hoping to increase that! 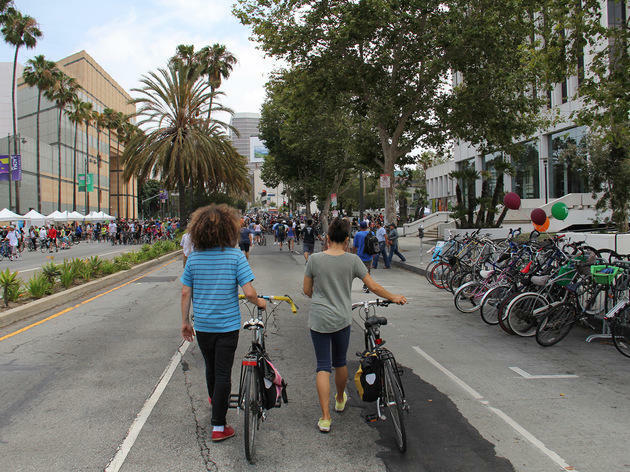 ), CicLAvia gives people the opportunity to re-purpose city streets for biking (and anything else you'd like, but primarily biking). Anywhere from 2-12+ miles are typically closed to traffic on any given route, and it's a great way to get some exercise and explore your city. Common routes involve Wilshire, Venice, and explorations of downtown to Chinatown, Little Tokyo, and Boyle Heights. There are tons of food trucks and booths along the route. It's easiest to take public transit (9/10 times the subway connects to the route) to get there--embrace car-free living for the day! Bring sunscreen and go early--the routes get more crowded the longer the day goes on. Also expect that on shorter routes, things can get overcrowded. That said, it's always worth it to get a new perspective on the city, explore areas you've never been to, and see the city of LA come out in full force to put the event on and participate. 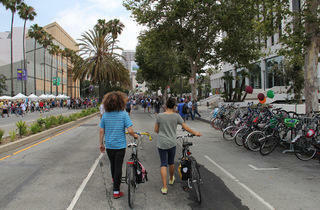 CicLavia is one of the best free events in the city! It brings everyone together and gives the city a break from using our cars, even if it's for only half a day. Cyclists dress up in costumes and deck out their bikes, so it's also great for people watching. I highly recommend it if you have never attended. Our family enjoyed our second cicLAvia today! My wife, son and I took the train to the Union Station in DT LA. Amazing train station - so much soul! The train ride was so much fun filled with 100's of bikers from The OC!! We got off and started biking towards DT, the Mole (mole-a) festival sidetracked us at Olvera street for an amazing lunch...We continued biking with the masses towards City Hall. We pit stopped at the new Grand Park, they were jamming with great music in the park. The weather was amazing as usual and the diverse Angeleno energy made for a fun-filled family day!! !